Corcoran® Marauder 10" Leather and Cordura® Nylon Combat Boots These combat boots have puncture resistant steel bottom plate to help you stomp through the toughest terrain! For years, Corcoran® has been making military footwear for the bravest folks working in the toughest conditions... from paratroopers landing behind enemy lines in WWII to the combat boots laced up by soldiers in Iraq. Whether it be tactical or time clock, you'll find that very few combat boots hold up quite like Corcoran®'s leather and Cordura® nylon Maurauder Combat Boots. Their removable DRYZ® insole controls moisture and odor, while providing shock absorbing cushion. It's combined with the Cambrelle® abrasion-resistant fabric lining that wicks away moisture and a special ribbed steel paratrooper shank for comfort and support so you can soldier on safely and comfortably! Each military boot weighs approx. 32 ozs. State Size, as available in Shopping Cart. 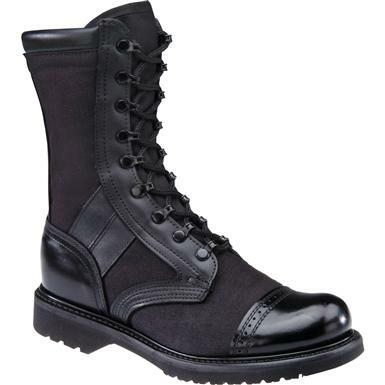 Corcoran 10 Leather and Cordura Marauder Boot is rated 4.7 out of 5 by 3. Rated 4 out of 5 by EMorgan from Good value for the price. The item arrived promptly and as described. The sizing holds true to "military issue" type footwear sizing; as I wear a 10.5EE, this is especially nice, since a lot of pairs of shoes/boots I've purchased in the past haven't quite fit right. The only issue I have is with the tongue; for some reason, no matter how I position it, it always seems to initially rub my metatarsal/top of my foot area oddly. But once I've had them on for a few minutes, it seems to settle into place. Also, the laces aren't quite long enough; it would be great if they were another 6-8 inches long. As they sit right now, it's a little tough to don/doff them without unlacing the top 2-3 eyelets. These last to issues are the only reason I don't think I can give 5/5. But other than that, these boots are top notch; I wear them all day on my EMS job, and my feet don't hurt anymore when I get off duty. Rated 5 out of 5 by PatW from Greatest boots Ive ever ownerd I have owned multiple pairs of these, starting when the Army still wore black leather boots. I now wear them at work and will buy nothing else, as I have for the past 11 years.